Forty years after she was attacked by a masked killer, Laurie Strode prepares for the return of Michael Myers so she can end his murderous carnage once and for all. After several sequels that were poorly received by critics and audiences alike, the most recent film in this slasher franchise retcons all the sequels’s continuities, disregarding them and acting as a direct sequel to the 1978 classic. The movie delivers on the promise of intense sequences elevated by the frightening presence of Myers, and effective tension throughout these horror scenes. The blood and gore is also fittingly strong to amplify the fright of a masked murderer coming after these characters, with some nice cinematography and tracking shots as well. However, even though it’s quite entertaining to watch, most of the jump scares are pretty predictable and a lot of these scenes fall into familiar tropes. Jamie Lee Curtis reprises her role and does a terrific job as Laurie, bringing a layered character to the screen in every scene she’s in. The aspect that hasn’t been seen before is the PTSD Laurie faces and how she’s willing to go to far lengths to prepare herself and her family for the inevitable return of her greatest fear. The way Curtis portrays a woman affected by an incident even decades later and how she’s always looking over her shoulder, ready to bravely face the villain of the story is done very strongly. If only the movie focused more on her, as lots of the film cuts to uninteresting side characters that don’t serve a purpose to the main story and aren’t portrayed very well. Sometimes the movie doesn’t stick true to the promise of being the story of Laurie facing Michael one last time and instead focuses more on developing character who do nothing other than fall victim to Michael’s killing spree. The plot also basically follows the structure of the original and we can tell what the final showdown will be like even before the movie begins. 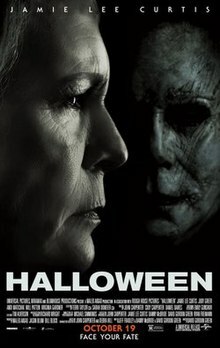 Halloween has plenty of fun scares and effective violence that will entertain horror fans but it borrows too much from the structure of the first film and doesn’t try much that’s new from the overall horror movie formula, and could’ve used more focus on its compelling protagonist. First Man tells the incredible true story of Neil Armstrong who took a giant leap for mankind by leading the Apollo 11 mission and becoming the first man to step onto the moon. I’ve been following the filmography of Damien Chazelle ever since he made a name for himself with the unforgettable indie Whiplash, and I again was there in the theater for when he rocked the world with the marvelous, award-winning, record-breaking La La Land. So of course I could not miss his newest big-screen hit, this time an adapted screenplay from a book on the true story of the mission that changed the world. Chazelle takes a well-known story and though we all know how it ends, he makes it feel exhilarating and gripping. Every shot is breathtaking and the cinematography is an achievement for modern cinema. The camera angles are perfectly selected, making these scenes riveting, and the shots of space, Earth, and the moon are incredible. It’s hard to tell how much was practical and how much wasn’t because it looks so realistic. The sound and editing also make for intensity and strong effectiveness in the action. The moon landing scene will glue your eyes onto the screen, and even if you know how it will end, it’s so beautifully done, with the music, tension, and even emotion by the end make it the most unforgettable scene of the entire year. 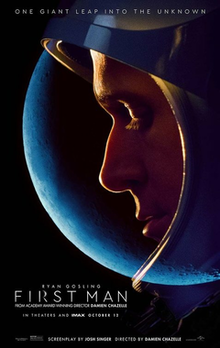 Ryan Gosling brings out another moving performance as Neil Armstrong, with subtle moments from beginning to end that will bring emotion to you like almost no other actor this year, and Claire Foy brings lots of strength to Janet, Neil’s wife, in sequences that will guarantee her an Oscar nomination, as well as very impressive chemistry with Gosling. Chazelle directs this mission delivering strong themes like how the hard work of many can achieve the most impossible dreams, and we see how much training was required but also the hardships that occurred during the preparation for the launch. There’s also some very powerfully written parts, showing a tragedy that happened in Armstrong’s life and how his family felt about him embarking on such a journey. The cinematography always stands out with the rare 70mm format making it look even more like a period piece, and like I said, every scene set in space will blow you away and make you need to catch your breath at the end. Every shot is so brilliantly composed and the handheld cam even works for the effect of intensity — at times it feels like Chazelle wants you to be on that spaceship with the characters. The music by Justin Hurwitz is also fantastic and deserves him another Oscar win, and I doubt any score this year will top the amazing music in this film and the effect it has on many great scenes in the film. However, there is one major flaw I have in the writing of the film — I felt like we didn’t feel much of Armstrong’s personality, and didn’t really learn much about who he was other than what we did. The movie makes some attempt at a personal arc for him which works very well, but if we had seen more about his relationship with his wife and kids and how the events of his life shaped who he was as a person, perhaps his character would be more compelling as well as the performance. It felt like the movie focused greatly on the Apollo 11 mission and the space journey Armstrong embarked on, but if only he had embarked on a bit more of an emotional journey as well. I personally felt more attached to Gosling’s other characters like Sebtastian in La La Land, the Driver in Drive, and K in Blade Runner 2049 because those films dug deeper into those character’s emotions and personalities while this film only scratched the surface of that. Thankfully the technical aspects and overall story redeems the film, with a marvelous second half that deserves a second directing Oscar for Damien Chazelle. First Man is a technical masterpiece with wonderfully directed and shot sequences that will floor audiences, and even though I don’t think this will become one of my favorite movies like Whiplash and La La Land have, the performances and especially the out-of-this-world journey, one you know so well but is brought to screen with top notch execution, makes it a film that must be watched on the big screen. A musician named Jackson Maine helps a young singer and actress named Ally find fame, and they fall in love as their careers spiral towards different directions. A Star Is Born shows that incredible passion both in front of and behind the camera can pay off wonderfully — and that an old story told well today can still stick with viewers. Bradley Cooper’s directorial debut is a stunningly told story of love, fame, pain, addiction, talent, and dreams. Cooper directs every scene with lots of energy and his editing and direction pay off to elevate the engagement and payoff of many scenes. His performance as Jackson Maine works on so many levels — Maine is a man you hate but love at the same time — he’s charming and caring but also has problems of his own that he deals with selfishly. Cooper dedicates himself to the role and has plenty of emotion that will move you to the core — and he can also sing very well. The complexity and might he brings to the screen makes his role worthy of an Oscar come awards season. And then there’s Lady Gaga — we already knew she has talent when it comes to her singing voice, but I could never tell that she wasn’t a professional actress and that this is her first major film role — she blends in with the other acting talents perfectly and stands out in her every scene. Gaga is remarkable as a woman who finds her voice and pursues her dream, and her range of emotion and presence are striking. I expect a Best Actress nomination for her as well. The chemistry between the two as well as their performances elevate the film and make it so interesting for the viewer — it wouldn’t have been the same without the dedication these actors put into their roles. 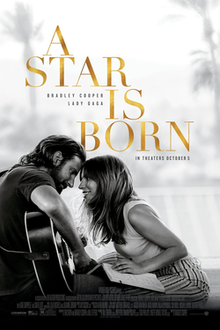 Also worth watching out for is the music — “Shallow” is a new original classic that I know will become more popular once more people see the film and Cooper and Gaga perform it ecstatically in one of the most memorable scenes in the film. Even though the overall story structure isn’t anything brilliant, and it’s the fourth remake of a film from the ’30s, the execution and delivery of the story is still made so effective for the audience and will resonate with you after the credits role. Some scenes will make you laugh, smile, or even cry, and the emotional connection to the audience is built so well that the ending will crush your heart if you’ve been engaged for the rest of the movie. A Star Is Born will definitely stick with viewers until the Oscars come around, where I’d say it has a really good chance, especially for its marvelous leading performances that deserve to win and the acting alone earns makes the film a recommended watch. Aside from that, there’s excellent directing and music, and Bradley Cooper has found himself an excellent voice in front of and behind the camera, as well as on stage, in an achievement for his career. Eddie Brock is a journalist going after insane corporate head Carlton Drake, only to get infused with the same threat he fears — a symbiote that calls itself Venom and lives inside of Brock. The two beings band together and must now take down a master evil plan before it’s too late. Venom seemed like what could have been a dark antihero/villain story that would take a risk and maybe give Sony’s Marvel property a little hope, and with the cast and director, it seemed likely at first. However, what Venom ends up doing is turning its story into a cartoonish and predictable superhero story that has no hints of the darkness that makes its character a memorable fright in the source material. Even with the light tone and pace, the great actors all deliver unimpressive performances and the writing is nothing that hasn’t been done before. There is nothing unique about Eddie Brock that is brought to the table — Tom Hardy probably has much better projects ahead of him that maybe he’ll even enjoy doing next time. Michelle Williams also seems like she’d rather be anywhere else, and the chemistry between her and Hardy feels flat. Riz Ahmed’s villainous character’s writing is so annoying that at times it gets painful, especially after he meets a symbiote of his own. Hardy and Williams are two of the generation’s most promising performers — and I expect good things from Ahmed as well — but the poor dialogue for them and lack of unique personality for any of the characters is what makes them forgettable. The action sequences are very poorly shot, with too many cuts and unclear angling during what could have been cool moments for the audience to connect to the hero — like Marvel has achieved with its MCU heroes and even with other Sony properties like Spider-Man. The connection between Brock and Venom doesn’t feel believable either and way too rushed, and at times the film tries to be funny but often crosses the line to cringe-worthy. The visual effects look horrendous and don’t blend into the rest of the shots — the final battle between two symbiotes was the worst superhero movie fight I’ve seen in a long time. Venom delivers some scenes that could entertain or frustrate action lovers — and either excite or underwhelm comic book fans. It doesn’t tie much into the Spider-Man universe despite a few post-credit nods that I won’t spoil, and other than that, the character of Brock/Venom isn’t given the big screen justice he deserves and the way Venom is treated as a superhero feels way too rushed. The development doesn’t feel complete, the script plays it too light and safe, and the plot is so predictable one could have guessed the ending as soon as the film started. The lackluster writing and unsatisfactory action compromises something new for the same old formula that was still used three Spider-Man actors ago. Venom is supposed to be a much more dark character but instead the titular symbiote often feels like a joke to the rest of the film. Perhaps this film could’ve benefited from an R-rating to fully realize the grittiness of the character and allow the director to make something unique — what’s the point of hearing Venom talking about eating people’s heads when we hardly get the satisfaction of seeing it? It doesn’t feel like the director had much of a say in the creative execution of the film (not that there’s much creativity in the film anyway), and it’s simply Sony looking for a way to say that they’re still trying to launch their own universe when there is Venom doesn’t go for any strong character arcs, visual feelings, story nods, or any reason for us to care. Marvel fans may want to give this one a try, but maybe this movie is best left outside the world of Thanos and the Avengers — and not on the must-watch list of die-hard movie lovers.